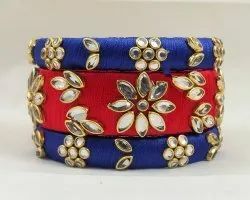 We are a leading Manufacturer of pr fashion launched beautiful designer bangles from Surat, India. Here Is A Beautiful set Of contrasting Colored Bangles Made With Resham Thread And Stone Work. You Can Pair It Up With Either Of The Color From Both The Bagles. Also You Can Add Up With Pretty Simple Bagles To Make It As A Heavy Set.